The walls of the first floor gallery at the Bemis Center for Contemporary Arts haven’t seen anything quite like this. It is doubtful viewers have either. A current exhibit, The Unorganized Territory, features primarily large-scale tapestry forms by Kansas City artist Garry Noland, who was awarded this solo show as a 2012 Bemis Regional Juried Exhibition winner. But unless you saw that show last year, there is little to prepare you for Noland’s spin on fabric art in this exhibit, which continues through May 4. Bemis viewers familiar with artist Mary Zicafoose’s delicately and elegantly woven work, oft seen on the venue’s walls, are in for an attitude adjustment in The Unorganized Territory. Noland’s variation on the medium is created solely of duct tape that combines the de-saturated palette of this material with the accumulated detritus stuck to it from his studio floor. Hesse McGraw, Bemis chief curator, describes the artist’s visual vocabulary as akin to Modernist paintings, ‘80s pop culture and Coogi sweaters among other references, complimentary or not. Regardless of its influence, Noland’s aesthetic makes an immediate impression. And like some contemporary abstract art on display, first viewer impressions may not be trusted. What at first may look no more appealing than indeed Noland’s studio floor or discards from a kitchen demo that unearthed a maze of multi-colored tile or linoleum, deserves a second look and even a second thought. It’s no coincidence that this seemingly unrecognizable and unorganized territory was first witnessed in the experimental and now dormant Bemis Underground. Both former Underground curator Joel Damon and McGraw made it their mission below and above ground to question and challenge concepts of contemporary art as well as the curatorial process itself. Past Underground shows such as Brittain Rosendahl: What Goes Down Must Come Up: Trial Ascension, Requisite, and Kan Seidel: Performing Human made that abundantly clear. Furthermore, Noland’s exhibit is yet another welcomed nod to McGraw’s continuing mission to examine and redefine notions of abstraction. His 2010 exhibition Borderland Abstraction set the stage for that investigation. More current fare such as Placemakers, nine artists who in multiple media “engaged in interventionist and transformative acts” and Nate Boyce: Plinth Inhibitor, sculpture and video, continue that conversation. In his artist statement, Noland says art for him is a “primary problem-solving communicative tactic. Each of us as artists and (viewers) has a responsibility to solve individual problems in the studio and…societal problems outside the studio.” Despite his altruistic and slightly pretentious tone, his counterintuitive, taped tapestries do make a statement on more than one level while managing to appeal visually on their own. As for “studio problem solving,” Noland’s fabric art has a green point of view with its mix of repurposed materials and recycled found objects, all of which have been stacked, layered or collaged. Though the work does seem “unorganized” and spontaneous, the large wall hangings that dominate the show are actually carefully composed as well. The kaleidoscopic and scale-like strips get all the attention until one notices that each piece’s uniquely colorful and informal pattern adheres to the same Tattersall background of pastel pinks, greens and blues, both a structural and visual motif that unites the entire show. Consequently, the exhibit is a form of conceptual abstraction whose whole is greater than the some of its parts, though individual works may appeal more than others. A holistic analysis and symbolic assessment may be appropriate here as Nolan’s conceptual POV is decidedly humanistic. “People are accumulations of genetic information,” he said. Following that, one could interpret his work as the quilting of one’s genetic make-up via the individual strands woven on the same DNA structure, the pastel grid mentioned above, that we all share. But the artist also allows that “layers and stacks of information and experience shape us” also. We are unique collages of nature and nurture, he implies. Which would allow for the assemblage-like quality of his work as well as its dualistic mix of geometric and organic patterns. In a last bit of interpretation curator McGraw contends that Noland’s quilting comments on his camaraderie with colleagues in the region where he has “often traded works with other artists…in this sense his work aligns with the history of gift economies and serve to authentically build community.” Yet another connection to Bemis’s own outreach mission via such projects as the Carver Bank residency program, which officially opened last weekend. If all the above sounds like a bit of a stretch for abstract art in general, then explore The Unorganized Territory for its clever sophistication. 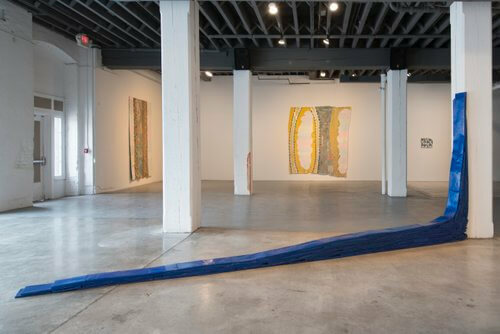 Whereas folk art and traditional quilts might seem out of place in this urban setting, Noland’s fabric art seems right at home with the gallery’s exposed mechanicals, beams and columns, bare windows and concrete floor. His colorful, contemporary tapestries light up the otherwise spare surroundings not as ornaments but as part of the fabric, like a vein of gold or quartz in bedrock. Live in the space for a while and absorb the ambiance. View the work from a distance first and notice the ragged edges of each piece as if each were a remnant torn from a larger tapestry layered beneath the surface. Venture closer and the dense mix of organic and geometric quilting begins to interest individually. Titles are of little help here, either prosaic as with “The Blue Ramp” sculpture in the middle of the gallery, subtle as in the “Ticket” or humorously expressive with “KA-Pow’s” cartoon graphics. Instead, pay more attention to the palette and pattern in each work that at first caught your attention and then drew you in, opening up your imagination as well as your senses like a flower. That’s the nature of abstract art that in its own way is no less representational when the design is this deliberate and fetching. Perhaps the purest and most recognizable abstract form in this show is the op art #4, “Repeated Pattern,” as if other pieces weren’t as well. It’s a very crafty work not only because of its illusion of floating white blocks on a blue and whitish, checked background but because of its ironic command of its surroundings despite its relative small size. It’s a phenomenon consistent with Noland’s belief that “one cannot tell A, B and C apart if there is no space between them.” Thus some creative curatorial hanging results in an asymmetrical balance when looking at the south wall of the gallery as a whole, an effect often overlooked by viewers. Equally compelling are the less definitive, more expressive #s 7 and 8, “Drape” and “Billet” and the companion 5 and 6, “Large Zipper” and “Zipper.” “Billet is an effective blend of paisley and geometric in pink, green, blue and gray while “Drape” frames two strips of hounds tooth and herringbone in earth tones around the familiar grid with a strip of silver and a lattice of pink, gray and beige slicing in for relief. But it is with “large Zipper” and “Zipper” that Noland offers the most satisfying blend of his many influences and references. The title motif in both opens up a dazzling display of bits and pieces of pure color that suggest July 4th fireworks, a peacock in full-feathered bloom or even the fabric of a Gustav Klimt landscape or a Whistler nocturne. There is some irony then in this exhibit’s name, for as “unorganized’ as they may appear given their source material, Noland’s tapestries are nonetheless harmonious abstractions, torn and taped remnants of industry, nature and art.